So imagine you’ve just come off a world tour in 1975, supporting an album many people consider to be the greatest rock’n’roll album of all time (“Dark Side of the Moon,”) – and absolutely one of the greatest selling albums of all time. How could you possibly follow that up? By creating another one of the greatest rock’n’roll albums of all time, obviously. Waters, Gilmour, Mason and Wright continued to push the limits of what studios at the time were capable of, crafting a lush, intricate, and challenging set that has yet to sound dated in any way. 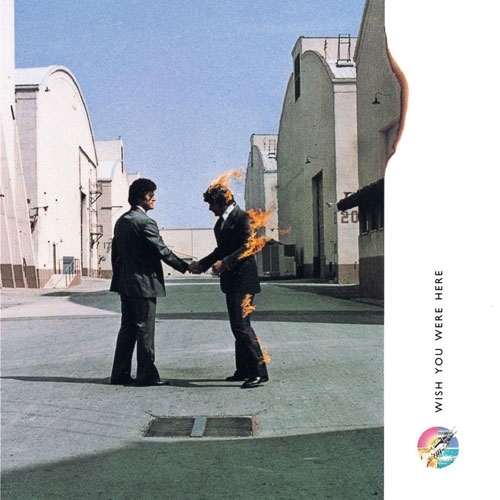 The muse/meaning behind “Wish You Were Here” was founding member, Syd Barrett, who was dumped by the band when it became obvious his LSD-induced mental collapse was interfering with the band’s growth and (MASSIVE) success. The album serves as a love letter to Syd – and a mea culpa for betraying him. Of the Big Four Floyd albums (“Dark Side…”, “Wish You Were Here”, “Animals”, and “The Wall”), this has always SOUNDED the best, even if it is not my favorite (that’s reserved for “Animals”), so it was with no little excitement that I turned out the lights and hit play. I own the Immersion Set (now out of print), whose DVD-Audio disc includes the 5.1, Quad and Stereo versions of the album. If you were to go out and attain this mix, you’d need to get the stand-alone SACD of the album…they both share the James Guthrie 5.1 mix from 2009. Everything I said about the previous cut and it being straightforward…on “Machine”? Not so much . Very “quad”. Noises and instrumentation everywhere without being distracting. Very effective at punctuating the meaning/nature of the song. Almost a counterpoint…if “Shine On” is the character of Syd, then”Machine” is the world he couldn’t live in, overwhelming him, and eventually crushing him. And…back to the relatively straightforward. “Cigar” is, after all, the closest this album has to a straight ahead three-minute rock tune…so…very present in the front…rear reserved for the effects leading in to ‘Wish You Were Here.” Never been a huge fan of this song, but I appreciate it much more now. The grandaddy of the album…the song with the one line everyone knows, even if they don’t know the album…or the band (“two lost souls swimming in a fish bowl…”)…is really, realyy lovingly mixed. By placing the vocal and main acoustic guitar together front and center, you feel as if Gilmour is sitting right across from you, singing directly to you – or rather to Syd – if he happened to be sitting right next to you. The whole mix is stunning, actually…really present. So, for me, this is the best recording on the album…twelve plus minutes of some rock, some funk, and all brilliant. In fact, when I was learning to play sax at the tender age of 13, I would play along with this cut almost everytime, as my warm up. As for this version? Just a seamless, pleasant mix…never overworking your brain or too much fireworks. Oh!! And something I’ve never heard before!! There are speaking voices at the beginning of the track WAAAAY down in the mix. WHAT?! How did I not know this? One of my two or three favorite Pink Floyd recordings – made better! Overall? Pretty subtle usage of 5.1, the result of which is to make the material crisper, more well blended – and somehow, more meaningful in the context of the album’s namesake. Well worth having!